Can Ginger Cookies Really Induce Labor? There are lots of things that supposedly cause someone to go into labor, and spicy food is one of those things. 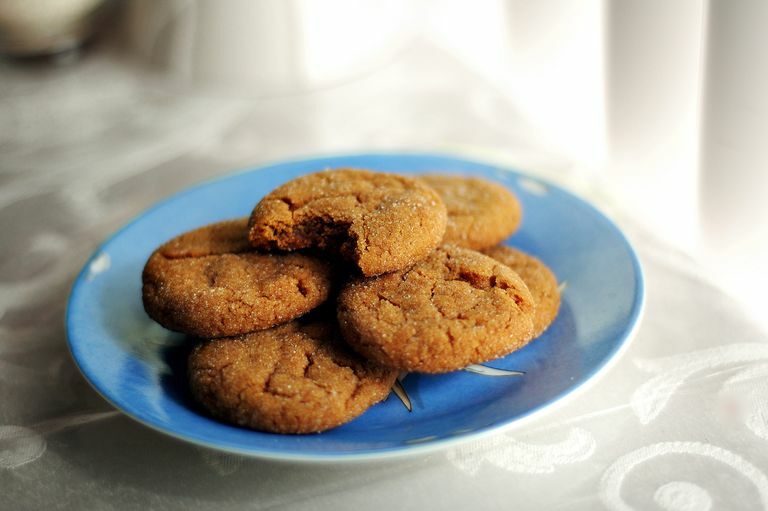 Though when most people think spicy, they may not think about ginger cookies as labor-inducing cookies, but a variation of these cookies has been floating around the Internet for a very long time. Supposedly, it's the spice from the ginger that works its magic on your body and causes you go to into labor. Ginger has been long discussed as a remedy for nausea and vomiting in early pregnancy, with some success. Though the use of ginger as a way to kickstart or induce labor is not as readily studied. These cookies also have an optional kick with the cayenne. Whether or not these spicy ginger cookies actually induce labor, I don't know, but they are certainly yummy! Supposedly after eating these, you'll go into labor within 24 hours. Please only try this on your due date or later; having your baby before your baby is ready can be risky both for your baby and you. When preparing these cookies, the yield is about 30 cookies. It will generally take you about 20 minutes to prepare the cookies for baking, and it takes about 10 minutes to bake the cookies. (Though how many cookies that fit on a cookie sheet may mean that you have to run a number of baking cycles. Keep this in mind when you are figuring out how long you'll need to prepare and cook.) You should also allow the cookies to cool before eating them. Begin by preheating your oven to 350 degrees. Combine the flour, baking soda and spice together in a bowl, mixing them together and set them aside. You will want to cream the sugar together with the butter. Then, slowly cream the molasses into that mixture. Once that's incorporated, begin the process over by adding the egg whites. Now you will add the dry ingredients a bit at a time to the wet mixture. This is usually best done by hand with a utensil. Once the mix is together, you will place 1-inch balls of dough onto your parchment lined cookie sheet. I add a bit of sprinkled granulated sugar on top to sweeten it slightly. Bake these cookies for 9-11 minutes, depending on your oven times. I usually recommend you watch the first batch to figure out a more precise time for your oven. Not all ovens bake at the same temperature, so times may vary based on your oven. Once the cookies are done, they will be slightly browned on the edges. Bring them out and allow them to cook on the cooling rack. Once they have sufficiently cooled, feast away! If spicy isn't your flavor choice, have some cold milk on hand to help cool your tongue. These cookies do have a kick, but again, you aren't making them as comfort food. Chaudhry Z1, Fischer J, Schaffir J. Birth. 2011 Jun;38(2):168-71. doi: 10.1111/j.1523-536X.2010.00465.x. Epub 2011 Mar 10. Women's use of nonprescribed methods to induce labor: a brief report. Lindblad AJ, Koppula S. Ginger for nausea and vomiting of pregnancy. Can Fam Physician. 2016 Feb;62(2):145.